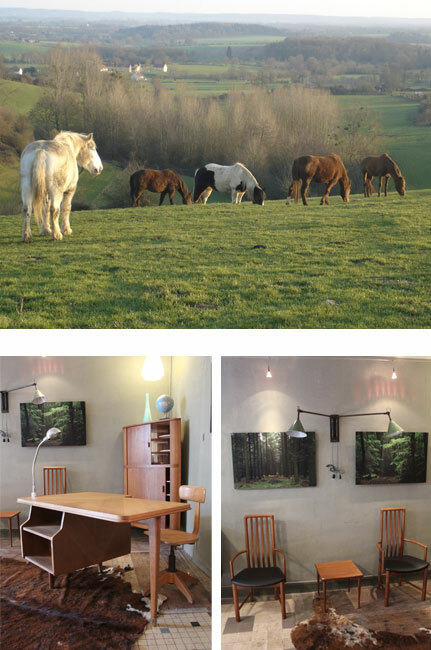 In Perche, the landscapes have a singular beauty that never leaves one feeling indifferent. They are punctuated by forests that play with the shadows and light, between hill valleys in the middle of woodland. A green escape par excellence, Perche has good food, beautiful places, historical sites, stately homes and mansions, is full of antiques and boasts regional specialties such as black pudding and cider. 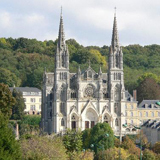 Here, we take a scenic stroll to the smell of mousse fraîche and take in the delicate charm of Bellême, Mortagne-au-Perche, Logny au Perche, Boissy Maugis Rémalard, and Condeau that each deliver their own particular beauty throughout the Parc Naturel Régional du Perche. 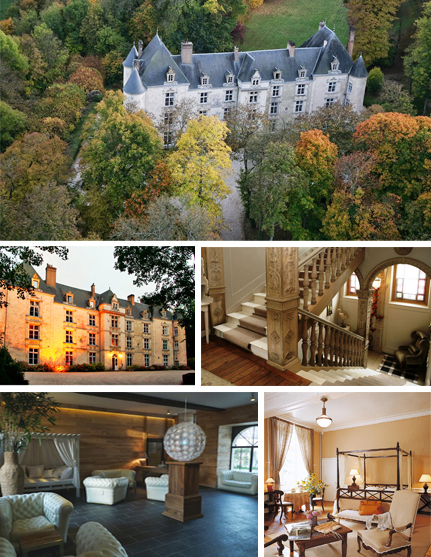 Thought of as the most beautiful village in France, Mortagne-au-Perche consists of largely sixteenth century bourgeois mansions (including that of Henri IV) and mansions from the eighteenth century. Fortunately preserved through the war, the rich architecture of this medieval city begins in the tenth century. 27 sundials, spread throughout the sights of the city are dotted along the cobbled streets leading to the farmer’s market from the main square streets. On Saturday morning, you can stock up on raw goat cheese, local cider and especially black pudding, a specialty of the city. 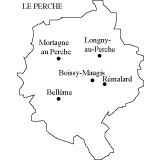 From March 15 to March 17, 2014 – the capital of black pudding, Mortagne au Perche is hosting a fair dedicated to black pudding and other regional products. The former mansion of Hocquart de Montfermeil family, collectors of stately homes, has been converted into a charming guest house by Armelle Lyonnet and Pierre Santarelli. The eighteenth century building, renamed the Hotel des Tailles, has regained its beauty through the work of the owners who have patiently stripped doors, windows and paneling to restore the house to its former glory, adding their own twist to the Provencal and English accents. A mixture of original styles are found in the four rooms of the guest house. Beautiful wrought iron balconies with delicate tracery and beautiful entrances dotting the cobblestone sidewalks of the old medieval city, embellished with charming houses and mansions of notables and wealthy merchants fro; the seventeenth and eighteenth century. 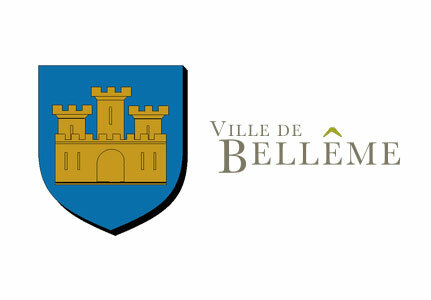 The perfect place to shop for china, Bellême, the walled city, is home to the vast majority of antique shops in the area. Built as a workshop, the brand new MMXI boutique is chic and feminine with a pretty selection of bric a brac. It has everything from Napoleon III globes, to beautiful frames and even Astier de Villatte candles. 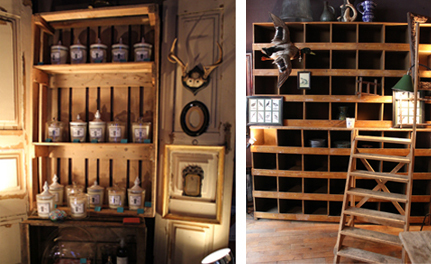 The Maison Fassier, previously located in Mortagne au Perche, is housed in the former post office of the city to create a cabinet of curiosities, as though it were someone’s home. Handmade furniture, chapel windows, glass sculptures, porcelain tableware found in a former Rémalard boarding school and painted canvases strung from the kitchen to the living room. 21, Rue Ville Close – 61130 Bellême – 06 07 34 36 72. 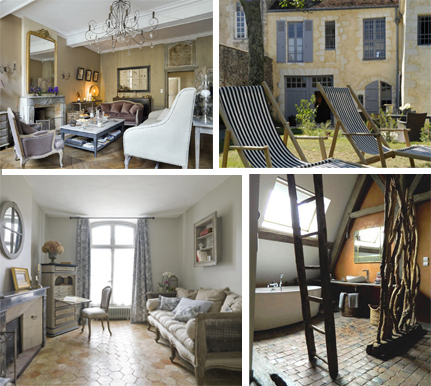 The Hôtel de Suhard is one of the most charming guesthouses in Bellême. Whether it’s an afternoon in the sun in the garden or by the fireplace in the living room, the house is just as agreeable in the winter as it is on sunny days. The rooms have been renovated with a particular respect for authenticity. The son of Cyrille Fassier has decided to focus on the restoration of doors and antiques from the 18-19th century. 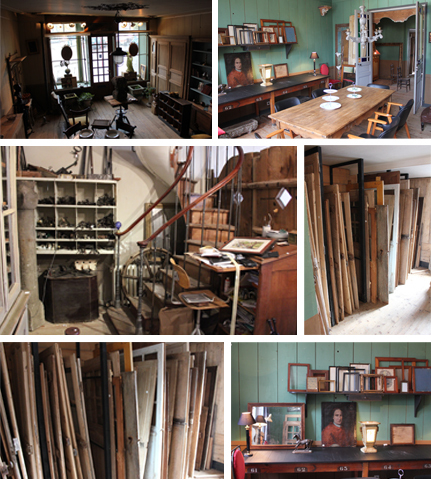 Located in Longny-au-Perche, this passionate antiquer runs a treasure trove of doors and woodwork on two floors. 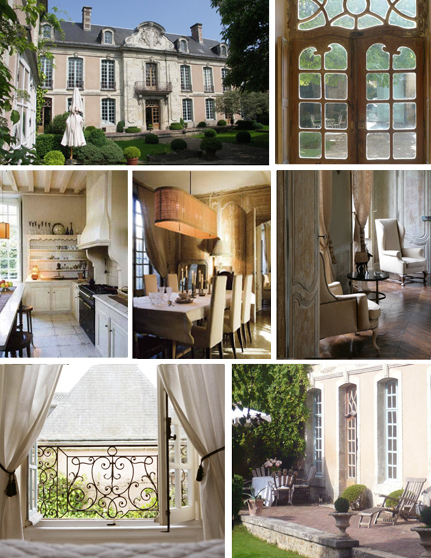 Fascinated by wood and known throughout the region, he dresses the doors of the country homes of Parisians. 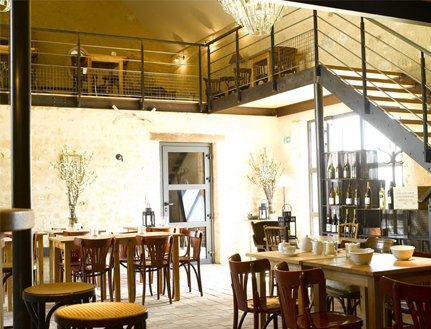 Le Bistrot des Ecuries offers up an incredible spread in an old farmhouse overlooking the valley of the Huisne. A selection of local produce and a wine list worthy of a gourmet restaurant. On sunny days, this semi-botanical garden is ideal for strolling or relaxing around the human-sized chessboard. The host – a charming 90 year-old lady who taught herself everything she knows about plants – is out tending to her garden every day. 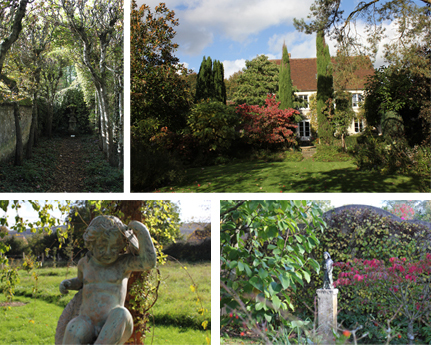 Hélène Andlau, who used to be an artist, has cultivated the most sublime plants, trees, flowers, ponds and fountains with a rare simplicity and refinement. Each of the ten Petite Rochelle gardens reveals an accuracy of colors and shapes, created by the owner. Jardin la Petite Rochelle – 22 Priory Street, 61110 Rémalard – February 33 73 85 38. In the small town of Condeau au Perche, the morning mist hides the beautiful Domaine de Villeray that extends for miles. At sunrise, reflected on the river and the soft sounds of water, the pool, tennis court and communal areas are converted into an equestrian center, below. The quiet rooms are decorated in pastel shades with refined furnishings that allow light to penetrate through the large bay windows that dot the façade. In the outbuildings of the hotel, the Spa Pom is a place to relax in harmony with the environment with a range of treatments based on the benefits of apple, the regional product par excellence.